WFT's embossing capabilities are wide reaching. Micro-Structured features are used to control light from simply bending light in one direction to diffuse light in a controlled manner or to create a complicated 3Dimensional image. We can replicate features as small as a few nanometers to over 150 microns in height. We emboss rolls of film product from 6" to 68" wide with thickness of 12.5 microns to 300 microns. WFT's Proprietary Tooling technology allows us to obtain shorter job turnaround with a degree of complexity possessed by few other producers in the world. We are capable of producing replicated structures with nearly vertical walls for application not typically serviced by a roll to roll production process which can deliver large volumes of product at economical prices. Once a structure has been replicated WFT has the capability to finish the product in-house. WFT is a one-stop producer for all your micro-structure replication needs. WFT has the capability of originating many forms of microstructures. We have in-house Diamond Turning, Holographic, and some Lithographic origination capabilities and can obtain other origination tooling such as Laser Oblation, Computer Generated Holograms and Dot Matrix holograms. Wavefront's Holographic capabilities are a result of years working on industrial applications employing Holographic Optical Elements (HOE'S). These were used for applications like linear and rotary encoders, back-plane reflectors for lighting application, telecom elements, etc. Our recording facility has produced the largest diffraction gratings in the world to meet the highest demands of the package industry. This lab is capable of originating Hoe's, Diffraction Gratings, and Holographic Diffusers (TMD®). Lithographic images can be originated using high quality mask to generate a 2 dimensional patterns with depths up to several microns. Our Proprietary Tooling has been developed over the last 14 years. WFT provides tooling to the holographic embossing industry and is known for rapid turnaround and high quality. This tooling technology allows WFT to combine microstructures (Step and Repeat) starting from as small as ¼" to as large as 48" x 72". With this technology, WFT was able to decrease the turnaround time in the holographic embossing industry from what use to take 3 weeks to as little as 1 day. WFT employs the same technology with DTM structures such as Prisms. Unlike other manufacturers of prismatic films who run directly off of a DTM cylinder, WFT makes master tooling from the DTM cylinder. We then combine the prism structure into panels which size is dependent on the final product. This allows us to build a tooling tree that we rely on to continue a product line for many years. Instead of having to re-cut a cylinder when an image wears out or gets damaged, we only go back 1 generation and make a new "copy" which is used to make the product. This is a cost effective method which allows for a consistent product with a long life. 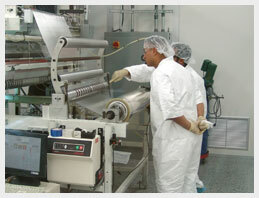 Production Equipment is custom built in-house and some operated in class 10,000 CleanRooms. Since the equipment used to make our products is specialized we had to design it ourselves. WFT has a full machine shop which builds and maintains our equipment. Because it is built here, we have the intimate knowledge that allows us to maintain, repair and improve the equipment. This equipment is proprietary and very specialized and would be difficult for a competitor to duplicate with out the years of experience we already have. UV formulations used to make our products are mixed in-house. WFT has a UV polymer lab used for R&D and a production mixing facility. WFT has many standard formulations produced in house by mixing various raw materials together. These formulations are used to produce product on our production equipment. We currently produce many different custom formulations depending on the required micro-structured product. Different structures require different raw materials depending on the specifications of the final product. This in-house ability allows us full control to adjust a formulation during R&D to work for a specific structure to achieve the desired result. WFT is a leader in the nanostructure and microstructure industry due to our vast experience with so many different structures. We have over 20 year experience working with microstructures as well as over 12 years producing rolls of product. There are few companies with the experience and ability to originate, tool up, and produce the custom products that WFT is capable of producing. WFT Technology, Inc. (WFT) produces a number of custom micro-replicated optical films. WFT's micro-structured films are manufactured in a Class 10,000 Cleanroom via a roll to roll process with widths ranging from 6" to 68". For additional information regarding our micro-structured films please contact our sales department at information@wft.bz.